This is one of those books where the standard 5 star scale doesn’t really work. It sits firmly between 3 and 4 stars for me. It’s taken me a long time to get back to finishing this book, not because it’s bad, but because I had a falling out with audiobooks last year, and have only recently really discovered the joy of them. It turns out exercise is hard work, but made better by good words. And this book (and series) have many good words. 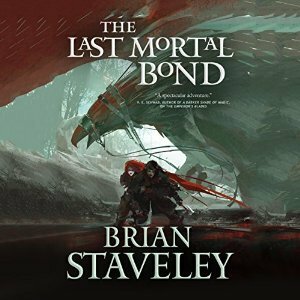 So I want to start this review by saying that Brian Staveley is a masterful writer. His ability to tell a story and philosophise at the same time is right up there with Mark Lawrence. It’s actually for this very reason that his stand alone, Skullsworn, was one of my favourite books of last year. This series, however, was not quite as good as that stand alone, and mainly for the fact that each book is so much longer. I love a bit of philosophising in my fiction, but there were times in this series where I wished the author would stop and get on with the story. It was never a big deal though, because honestly the prose is gorgeous! This is the third and final installment in the Unhewn Throne trilogy, and the conflict is ramped up throughout the book, with stakes becoming ever higher, and the odds ever shittier. Despite this, it reaches a satisfying, and not entirely predictable, outcome. Sometimes you see a thing coming, and that’s OK because the beauty is not in the surprise of it, but in the emotion of the delivery. Adare is still one of the most frustrating protagonists in the history of fantasy. Kaden is still a potato. All hail Gwenna as the rightful queen. In reality I’d give this one a 7 or a 3.5, but I always round up so 4 stars it is. And 1 more thing. I listened to this as an audiobook and Simon Vance is one of the best narrators out there. A real master who helped bring the characters, world, and story to life.